Wrapping a Gift is an interactive make-it-yourself activity. Readers choose the wrapping paper and ribbons to wrap a virtual gift package. On the final page their gift design becomes part of a printable card. They can personalize the card, print it and send it. There are spaces to fill in the reader’s name and the name of the one who will receive the gift, and a place to describe the gift. With three choices of wrapping paper and three choices of bows, nine different gift designs can be created. Realistic sounds of the paper unrolling, scissors snipping, and tape tearing and sticking make the wrapping process feel authentic. The final page lets students turn on their imaginations, deciding what would be in the box “if wishes came true”. I have marked this activity as appropriate for grades 1-6, because of the simple vocabulary and universally appealing content. Actually, adults may enjoy planning virtual gifts. See what clever, wild, or funny ideas you can come up with. If it’s really the thought that counts, this activity is a great option in a year when funds are limited! To help you think of good gift ideas and get the finished card printed, my daughter Ellen has set up a special help page for this activity. Click here to go to her page for printing tips, gift ideas, and a link to some excellent free holiday clip art. There is an online version of Wrapping A Gift, and downloadable versions for Clicker 5®, HyperStudio 5®, PowerPoint®, and IntelliTools Classroom Suite®. The Classroom Suite version has a custom IntelliKeys® overlay attached, and there is a Dynavox® version of the overlay. See the Special Needs Access section on the System Reqs page for information on controlling the Classroom Suite version from PRC devices. Refer to the HyperStudio is Back! page for information about downloading players to run the HS5 version of this activity. The My Own Bookshelf® version is a straight line story resulting in just one of the gift designs, but includes the sounds. There is also a PDF version to use onscreen or to print, but it does not include the sounds. 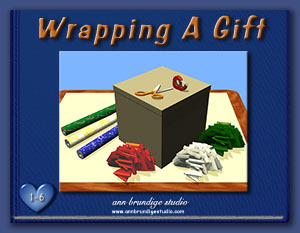 You can download a bonus clipart collection, including everything for wrapping a gift, starting with the empty box. The collection includes all nine wrapped package designs, opening the way to devise matching and pattern games. I’ve also included sheets of gift tags you can print and use on real life packages. CLICK HERE for the Wrapping A Gift activity to read and complete online. Plan to print the final page. Click here for extra help with this activity. For details on using Annie’s Books Online, click here. Desktop version of Wrapping A Gift link: giftwrapDesktop.zip Wrapping A Gift activity to read from the desktop using a web browser. For details on using Annie’s Books Online, click here. WrappingAGift.pdf 4.8 MB) Wrapping A Gift activity to print. No sounds. Acrobat Reader. WrappingAGift.clkt.zip (4.3 MB) Wrapping A Gift activity activity in Clicker 5 Mac or Win. Has sounds. WrapGiftSuite.zip (12.1 MB) Wrapping A Gift interactive book in Classroom Suite v.3 or later. Custom IntelliKeys overlay is attached. WrappingAGift.dpkg (FILE SIZE MB) Wrapping A Gift activity overlay saved as a Dynavox package file. WrappingAGiftMBS.zip (3.5 MB) folders with WrappingAGiftMBS.zip book to import into My Own Bookshelf. WrappingGiftPPT.zip (12.7 MB) Wrapping A Gift interactive book saved as a .ppt file. Keep .ppt file and sounds folders together as you decompress the zip file. PowerPoint 2003 or later. GiftWrappingClipArt.zip (3.1 MB) Clip art including scissors, tape, wrapping paper rolls and tileable designs, nine wrapped gifts. To preview the collection, click here. TieOnGiftTags.pdf (1.9 MB) PDF format printable sheet of three different gift tag designs with tab to punch out and use to tie tag on package. Acrobat Reader. StickOnTags.pdf (1.7 MB) PDF format printable sheet of three different rectangular gift tag designs to print out and stick on packages. Acrobat Reader.